John Zimmerman didn't want to write the final chapter in the history of Conkey's Bookstore, a fixture in downtown Appleton for 113 years. But a confluence of events led the 70-year-old grandfather of six to give up the business he'd owned for 30 years. Zimmerman lost contracts to sell books for two local colleges at a satellite bookstore he owned, which gutted his primary source of income. Appleton also constructed a new bridge that redirected traffic away from a downtown business district that was already on the decline. "The combination of all of this was too much for me to try to fight it," Zimmerman said. 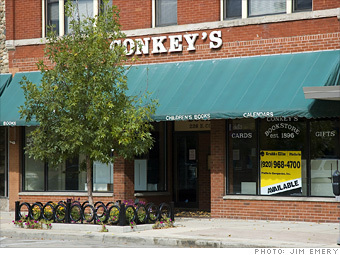 Conkey's was the oldest independent bookstore in Wisconsin. Though several people expressed interested in buying Conkey's to keep it going, the economy and other factors prevented any of the deals from working out. One of the potential owners couldn't get financing, and another's family did not want to relocate. Zimmerman said he still receives condolences from Appleton residents about the store's closing as he goes about his daily life as a retired person, but he's happy to have more time to spend with his family and friends. "Money is one thing, but they're most important," he said. One local resident sad to see Conkey's go was Chad Nehring, an Appleton-based financial planner. "I can recall going a lot there as a child," he said. "It's a real loss here."